The world over, New Year’s Eve is arguably the most celebrated night of the year. In fact, it has been celebrated since the invention of the calendar, some 4,000 years ago. Marking the end of an old year and welcoming in a new one, it is the time to gather with friends and family and raise a glass of bubbly. While some people are happy to watch the celebrations on television, others attend parties, visit firework events, or carry out particular rituals and traditions specific to their region, country or culture. New Year’s Eve, or Hogmanay, is serious business in Scotland. It involves setting paper balls of fire alight, accompanied by bagpipes blaring. The first person to cross the threshold of a home in the New Year must bring a gift, and if that person happens to be tall, dark and handsome, the homeowner can expect good luck! In Ireland, New Year’s Eve involves going outside and throwing bread at the walls of your house to ward off evil spirits, followed by a family dinner. Over in Denmark, after listening to the Queen’s speech, Danes welcome the New Year by smashing unused plates and dishes. Dieters in Estonia will probably find New Year’s Eve tricky, as it’s customary to eat up to 12 meals on this day, to ensure abundance for the following year ahead. If you visit Mexico on New Year’s Eve, avoid walking close to houses, as residents throw water out of the windows to wash out the old year. A similar tradition follows in Puerto Rico, but it also includes eating 12 grapes at midnight. Head to Peru and you might just wonder why people are placing three potatoes under a chair on New Year’s Eve. This tradition involves picking a potato out with your eyes closed, and if you pick one that still has its skin on, you’ll enjoy a prosperous year ahead. While many unusual traditions take place on New Year’s Eve, most commonly a fireworks celebration dominates many countries, and this is often televised. These colourful displays often take place near famous landmarks, such as the Sydney Harbour Bridge in Australia, the Eiffel Tower in Paris or Times Square in New York. In London, the famous skyline encompassing the Thames, Big Ben and The Houses of Parliament is at its finest on New Year’s Eve, when it’s illuminated by a firework display that’s up there with some of the best in the world. 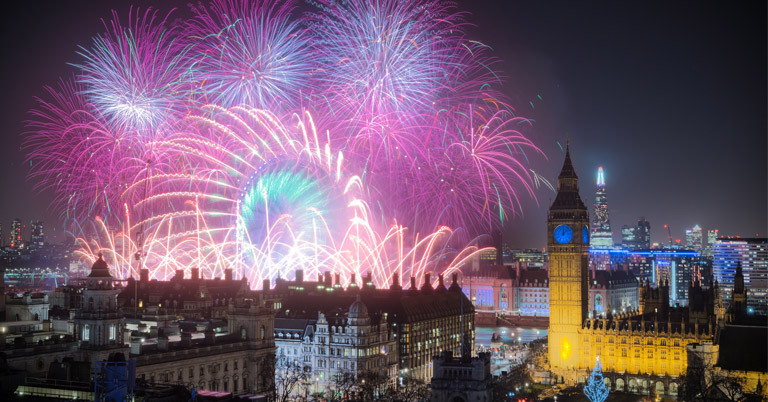 It’s estimated that around 10,000 fireworks light up the London sky on New Year’s Eve in a spectacular televised display lasting around 12 minutes. The light show is accompanied by music. Last New Year’s Eve, this included a female-only line-up, to mark the centenary of women getting the vote. If you want to view London’s firework display, it’s essential to buy tickets. Bear in mind, these usually sell out very quickly. Alternatively, you can avoid the crowds and watch the display on TV at home or down at the local pub. Whether you decide to visit London to watch the fireworks, or you plan to meet up with friends and family, why not consider hiring a van from H&H Van Hire to get where you want to be this New Year’s Eve? Perfect for a short getaway during the New Year period, you can also enjoy weekend hires.